HFT-70 Hydraulic Fracturing Tester - OFI Testing Equipment, Inc. The GCTS Hydraulic Fracture Tester allows for the performance of fracture tests with HPVC pressure intensifier. 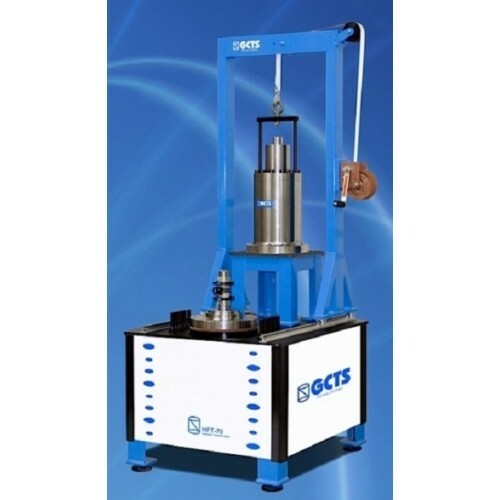 This fixture is typically used for hydraulic fracture, well bore stability, and permeability tests. Tests can be performed with or without confining pressure. The HFT triaxial cell comes with a hydraulic balance for application of hydrostatic stress state, but it can also be used for applying deviatoric stresses for anisotropic stress state with up to 140 MPa vertical stress on NX diameter specimens. A loading frame can be used to induce larger axial loads. The cell has 4 pore fluid ports plus a hydraulic fracturing fluid port, in addition to 2 confining fluid ports. Typically fracturing pressure is ramped up at a constant rate while radial strain is measured during the fracturing test to determine the fracturing stress. The system can also be upgrade with temperature control option for up to 200°C (332°F).